10 a.m., I’ve been on the road for the last 6 hours. Suddenly red lights, the road opens skywards. No, this is not Tower Bridge. Much more nature here, much more water. Coastline, lots of coastline. And heaps of windmills. Old Zeeland. Yes, silky-way has travelled far around the world again. Roughly 600 km. Old Zeeland? Yeah, it’s good old Zeeland, the Dutch region, which has given New Zealand it’s name. As usual: If silky-way doesn’t travel to the other side of the world, there is enough of the world to be discovered in Europe. So it’s the Netherlands this week-end. Kamperland in Zeeland. 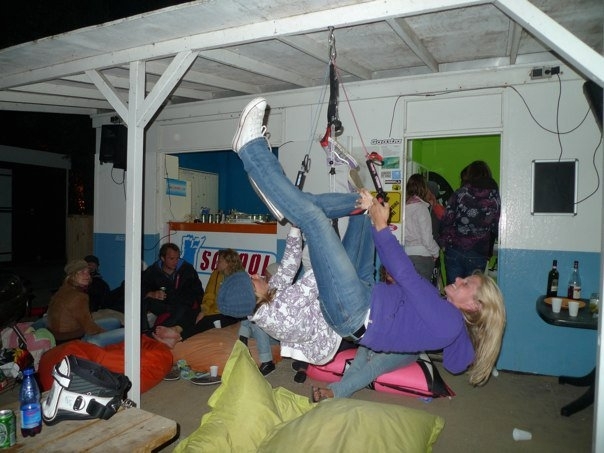 KB4girls calling, a non-profit worldwide clinic tour for female kiteboarders. Getting started – 9x world champion Kristin Boese is organizing arrivals, not-yet-arrivals, KB4girls-T-Shirts. Good old German organization, but at the same time relaxed. Flexible throughout the whole week-end. Well, how else could she be as a kiter. 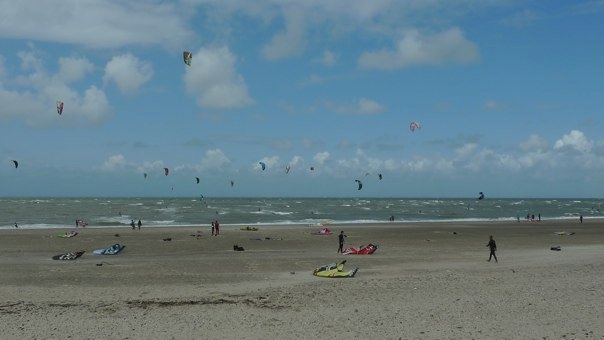 It just all depends on wind and weather when kiting. And as girls can be a lot less reliable than wind, organizing these week-ends has probably become one of her best skills. We are presenting ourselves to each other. Very interesting backgrounds: a video producer, a tv girl, a pole dancer with online vintage shop, and sometime in the past, one girl has even h ad “a husband and all that kind of stuff” and is now living more in her van than in her flat. When all is said and done, they all seem to have one thing in common: They live their lives the way they think it’s right. No wind yet. Best time for security briefing. Then nice 16 knots and flat water with east winds at Ouwekerke. Kristin is showing some tricks and jumps just 1 meter in front of the girls. Slow motion. No, I’m not kidding. 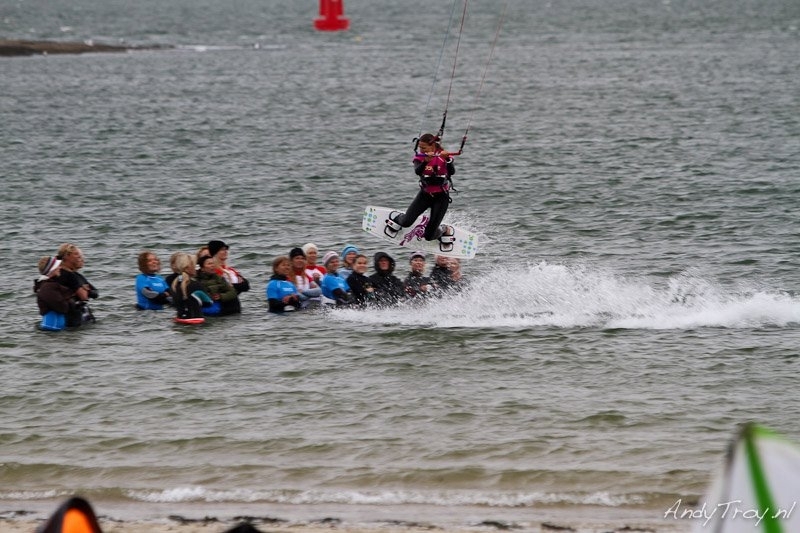 Never seen anybody so controlled with any gear, in any conditions, doing any jumps while kiting. The movements seem to be very well structured, smooth, accompanied by detailed explanations. Unhooked kiteloop railey? What’s exactly the prob lem about it? Eeeasy…you can do that just after getting on the board, I swear! Actually surprising we didn’t get the reverse slow motion version, too. After watching, kiting. Afterwards: big smiles on all our faces. Next day: survival training. Wind from Southwest at Neeltje Jans, 24-38 knots, good waves. Time for practicing the security briefings. And a fun day! 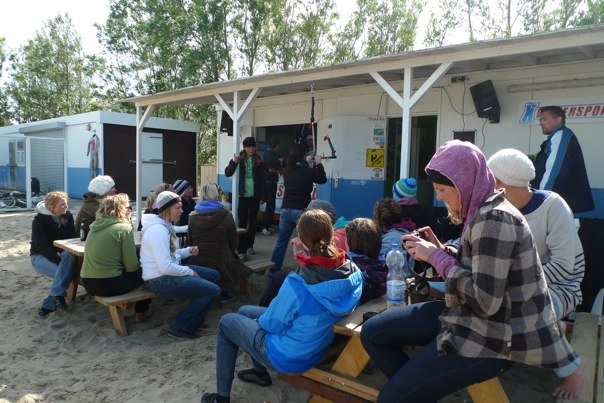 Between the kite sessions, theory lessons with Kristin’s training CD and simulator training on a bar that is fixed on the roof. Basically, all you have to consider to do a good backroll or frontroll is “Move your hips!”. I reckon Shakira would be an excellent kiter. The second evening, party time. Some girls went on practicing. A shame Kristin didn’t see – she would have been proud of her teaching success. Last day, Oostvourne West with west wind and up to 28 knots. Perfectly flat and shallow water to get the last bit out of the week-end. Even though each girl had had individual skill levels and objectives, the clinic was able to push every single girl to the next level during the week-end. It was a great week-end to really push each other forward. And do something good at the same time. The funds raised for the Netherlands event through our personal fundraising pages are going to Stichting Amazones, an organization that supports women with breast cancer. No, I’m not an angel. Perish the thought! I must say that the fundraising part wasn’t easy. It’s a shame that fund raising events are not that common in Europe yet. Honestly: What’s wrong about pushing yourself forward, either by running a marathon or learning how to assess risks while kiting – and by doing so raising funds for organizations that make sense? What’s wrong to say from an organizer’s point of view: I provide the infrastructure, but can you please help the dedicated organization if you want to participate? Isn’t that fair enough and actually a good thing? Whatsoever, everybody has a choice in life. If you have the chance to participate in one of these events, don’t hesitate – the spots are well chosen to make sure the probability for a good training week-end is high: be it in the US, Australia, Europe, Old Zeeland, New Zealand – go for it! If you’d like to read more about the Netherlands event, have a look at the press release and a corresponding article. For more information about my fundraising for the Germany event, click here. i love the pictures and the way you wrote this. perfectly! Very well written, enjoyable read 🙂 Will definitely look into the rest of your blog!